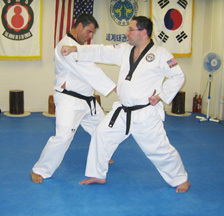 One Step Sparring is a controlled exercise where the attacker only takes one step throwing one punch. The response varies depending on which number is called. While each One Step Sparring is unique, they all begin the same way (see below). 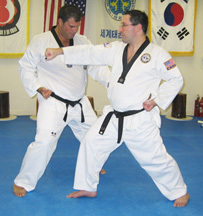 The attacker (the figure on the right) prepares to step forward and throw a single punch. Depending upon the 1-Step Sparring number called, it will either be a low punch, middle punch, or face punch. The figure on the left prepares in ready stance. 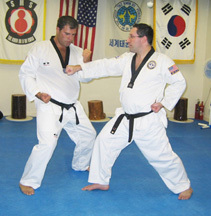 Response: Step to the side at a 45° angle into a Ju Chum Seo stance, inside block the attack, then double punch into the side.